I got home from the game this evening and was thinking back on our wonderful season and how far we’ve come over the last two years. 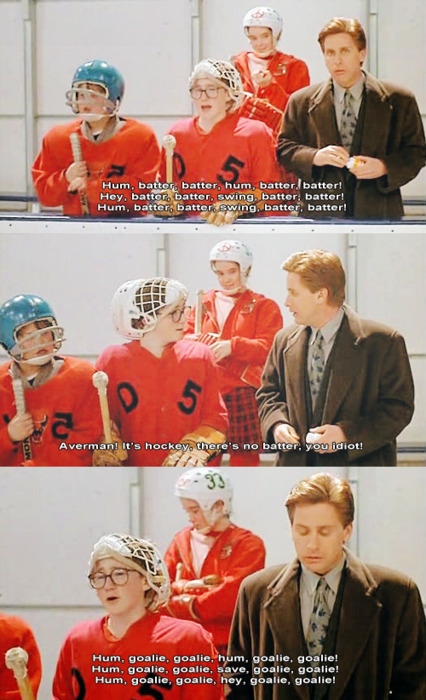 Earlier this season, Emily compared Preservation United with the progression of the team from Mighty Ducks – so with that in mind, I wanted to offer up this at the end of our season. Please keep in mind all references to hockey should be thought of as broomball. Last year this was how our season started. We felt an awful lot like that Division 5 team. We might have had a conversation like that. Erin was fearless all season and took up the mantle as Enforcer. There was training in the offseason. We returned to the ice this year with a new determination. Josh stepped up and took his natural place in the crease. Word spread of our play and the fans turned out in hordes. We used the occasional trick play. We played together as a team. And we had the best record in the Wells Fargo Corporate Broomball League. Posted on January 27, 2015 at 10:09 pm.